Lumex® Walkabout Lite 4 Wheel Rollator offers a stable, comfortable way to move about independently. Designed with an aluminum frame, this lightweight rollator weighs 14.5 lbs. and folds up for storage or transport. It features padded seat, backrest and storage basket. 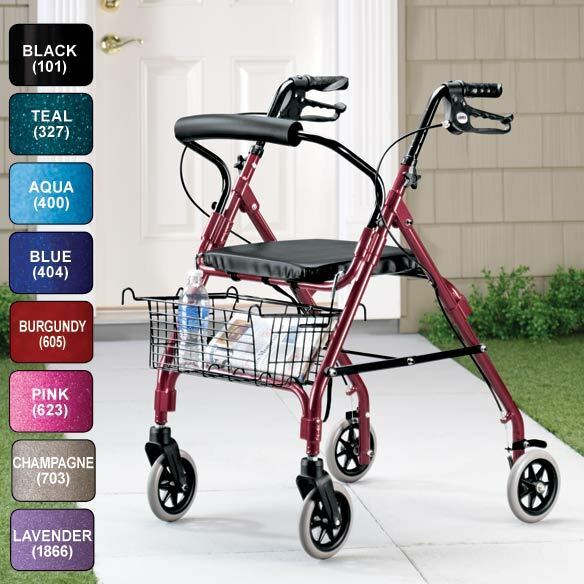 With four wheels that handle rough pavement and ergonomic hand brakes, this Lumex® rollator is easy to operate. 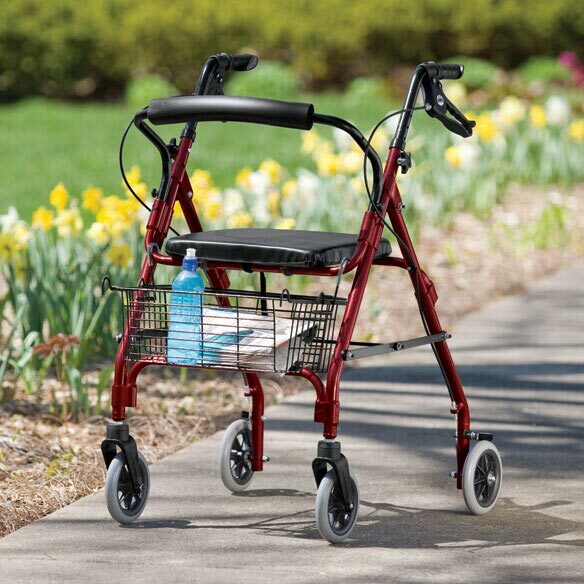 Handle adjusts to 32" - 37"H; seat is 14"W. This multi-tasking walking aid is designed to support individuals up to 300 lbs. Specify color code. Minimal assembly required. No express shipping. Allow 2-3 weeks for delivery. *Add $10 to shipping. Love it, Love it Love it! I had been using a walker-rollater for years as I have a physical disability with walking and balance. This walk about is wonderful, I love it so much. The price too is excellent. I paid almost 150 for the other walker-rollater that I had been using. This one was 89 and is built so much better. I think everybody should own one, this one is PERFECT! This rollator has enriched my life by giving me mobility that a traditional walker did not give me. It is lightweight, easy to fold and I can put it in my van without assistance. The seat is a good width and comfortable. I chose the burgundy color and it is very pretty. I am very pleased with my purchase. Helps my Mom get around. It is light weight, folds up great & is also adjustable. You have to learn to use this by remembering to lock the brakes. My husband really likes it and it's easy to maneuver around in a trailer. This works great for when I "fall down and go BOOM"! My Dad bought this for my Mom who has bad knees. It is easy to use, easy to store and Mom's posture is better because her weight is more evenly distributed than leaning on a cane. When she gets tired, she always has a place to sit. The best I've seen! This product works better than others I've used, such as hospital issued and another 4-wheeler with a seat included. The only thing not as good is the way it folds up for transport. The underseat basket must be removed and the walker folds up toward itself instead of the usual folding inward, so I transport the other 4-wheeler when I'd rather have this one. One of the things I like better than the other four-wheeler is that it is a little bit less wide and therefore goes thru doors and tight places better, similar to the smaller hospital-issued walkers. 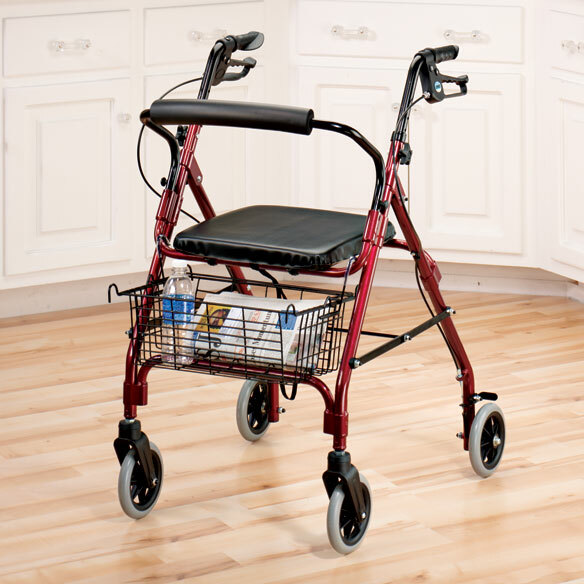 It beats the hospital walkers with two wheels because it rolls so much easier, and because of the included seat that can also be used as a carrier for purses and food trays. The back wheels turn all ways, which gives the walker more mobility. It's light weight and from past reviews is very reliable. A friend let me use her's and I found it very useful. Because it looks nice and sturdy and because it will hold up to 300 pounds. I have to use it to help carry in groceries so the weight capacity was a plus. To have a seat to rest if I go walking abit. I need one and I hope this is the right one. I already have 1 Lumex Rollator. I need a second one to keep at the bottom of my stairlift. My husband needs help walking, and this roll atop looked like a good but. Replies from earlier customers. Seems perfect for my needs. Thank you. I like the price and the quality of yours products. Very affordable and easy payments to fit my budget. ease of use and color! Price, basket not under seat to hold oxygen tank, color choices. I need it for walking after surgery. Ease of loading & unloading from our SUV. Light weight. This is our 2nd one as the first was crushed in car accident. I was looking for a narrow width walker to fit through a narrow bathroom entranceway. Personal experience with this walker has been very satisfactory. and is the size we need for a mobile home doorway. Also since I have a disability the weight is a factor for my wife having to put into our car. Anxious to use it. We are Florida folks so sunshine is in our favor. I thought the price was reasonable . All the reviews sounded great and the fact it is light will make it alot easier on me lifting it in and out of our van instead of my husband's wheelchair! I am grateful for the responses that helped me select this item. To assist my mobility due to a fall and then having lumbar back surgery. Need help walking and a seat as well. Are the rollator brakes easy to lock for those with arthritic hands and decrease strength? does walker come already assembled? BEST ANSWER: Not exactly. It comes in sections that you will need to slide together so you can adjust the height to suit you. But you don't need any tools to do it. I am avery short lady so ,how many inches between the seat and the floor? BEST ANSWER: Hi, I'm also a short lady too and so the walkabout measures 21 and 3/4 inches from seat to floor. Hope this helps. can I be pushed around while being seated? BEST ANSWER: Yes, you can. However, I would take care that you don't go over very uneven terrain or that you move too quickly because you might tilt forward or lose your balance, but I have been pushed when I have been on my feet for quite awhile and it worked fine except for the two caveats I mentioned. Thank you for your question. You can be pushed while sitting, however it is not recommend as it is not made to be used as a wheel chair. We hope this information will be of help to you. is this adjustable for a 6" tall person? BEST ANSWER: I bought this for my husband who is 6" and he has no problems using it; although, it is adjusted as high as it will go. It is a really nice walker and so easy to assemble. I highly recommend it. I think so. My husband is 5'10" or 5'11" and he uses it easily. It might depend on how long your arms are, but the height of the handles is adjustable. Where can I find a rollator that is 22" wide at its widest point? BEST ANSWER: Thank you for your question. Our widest rollator is listed in the link below. You may read about the measurements in the overview given. We hope this information will be of help to you. need one that is only 22in.wide at widest point? BEST ANSWER: Thank you for your question. The overall width of the rollator is 24.5". We hope this information will be of help to you. what is size of wheels 6" or 8" ? BEST ANSWER: Thank you for your question. The wheel size of the Rollator is 6". We hope this information will be of help to you. what is the widest width from wheel to wheel? BEST ANSWER: Thank you for your question. The width of the wheels are 24 1/2 ". We hope this information will be of help to you. how wide is back wheels? BEST ANSWER: Thank you for your question. The wheels are about 24 1/2" wide.We hope this information will be of help to you. How wide is the handles/wheels? I have narrow doorways in my mobile home. BEST ANSWER: Thank you for your question. This item is 24 1/2 inches wide. We hope this information will be of help to you. Will it fit behind the front seat of a car? I DON'T KNOW ABOUT THE BACK SEAT OF A CAR BUT IT DOES FIT BEHIND A ROOM DOOR. What are the dimensions of the basket? BEST ANSWER: Thank you for your question. The basket is 15 1/2" W X 9.6" D X 8.3" H. We hope this information will be of help to you. How much does this weigh ? BEST ANSWER: Thank you for your question. It weighs 14.5". We hope this information will be of help to you.